Lock in a great price for The Reef Playacar - All Inclusive – rated 8.2 by recent guests! Really a beautiful property. Well maintained. The grounds, pool and beach areas are excellent. I really liked how manageable the property is. Not tiny, but not huge like so many other places in the area. You can walk to the pools, beach or restaurants in just a few minutes - and the stroll is gorgeous. Our room was a little small and some mold spots in the bathroom, but worked fine for us. The staff really is awesome and truly caring. 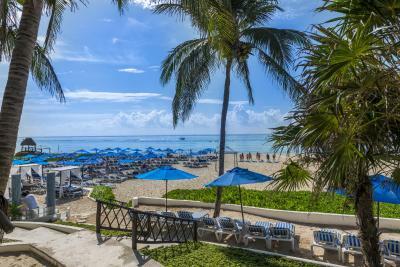 The location is just south of Playa Del Carmen in a guarded area called Playacar. It's a nice hotel with friendly staff. 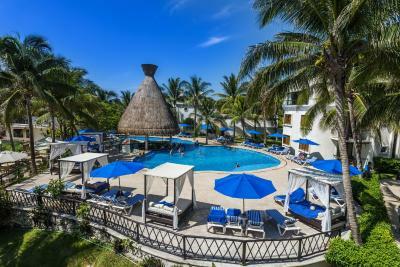 It's a beachfront resort just a brisk 15-20 minute walk from Playa Del Carmen. It's just north of another shopping mall. The buffet food and quality was excellent. I am celiac so the chefs were very nice to point out to me which dishes had wheat gluten and which ones didn't. I am very gratefuly. The normal all inclusive price includes food and drinks. It's a pleasant place. I enjoyed my stay. The hotel is very pretty, the garden and setting is wonderful and unique, and our room was nice and very clean - we slept well. The staff is helpful and always in a good mood. The beach is nice and there are enough beach beads. 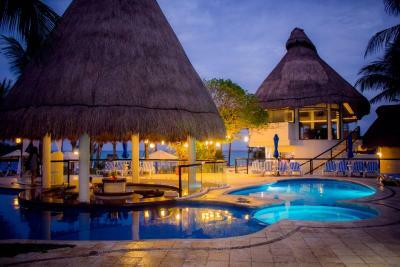 Great location in playacar far from al PDC noise. Food was very good and staff was good. Excellent service and beautiful jungle like gardens. The location and beach was amazing. We loved all the amenities and the drinks were always good. Staff was friendly especially Axel and the staff at the towel stand. Rooms were quiet and bathroom was very nice. The only nice thing about this property is that it has beach access. The hotel looks nice and has a little jungle with small waterfalls. It feels very relaxing. The hotel offers acces to the facilities even if you arrive a little before the check in time, I liked the buffet with wide variety of food, really tasty. The Reef Playacar - All Inclusive This rating is a reflection of how the property compares to the industry standard when it comes to price, facilities and services available. It's based on a self-evaluation by the property. Use this rating to help choose your stay! 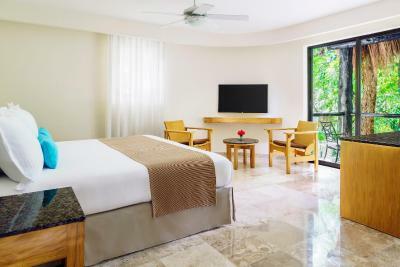 One of our top picks in Playa del Carmen.Nestled on the Riviera Maya coast just steps from Playa del Carmen, this all-inclusive resort features beachside villas surrounded by lush gardens, recreational activities and clear Caribbean waters. The elegant, air-conditioned rooms feature cable TV. Each one comes with a private bathroom and a private balcony. 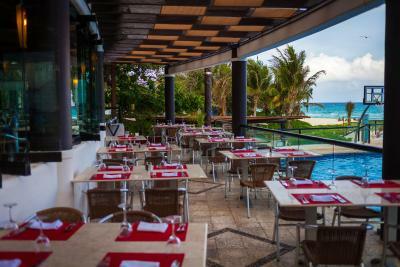 The Reef Playacar's all-inclusive program consists of all meals, snacks and drinks. Guests will also enjoy dance lessons, theme parties, shows and nightly entertainment. Activities such as sailing, kayaking, snorkeling and biking are also included. 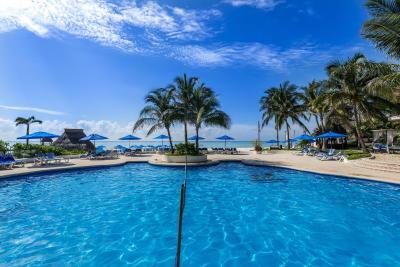 Facilities such as 2 swimming pools and a children's pool are available at Playacar Reef. Guests can relax with a massage at the spa, while the kids have fun at the resort's Kids Club. 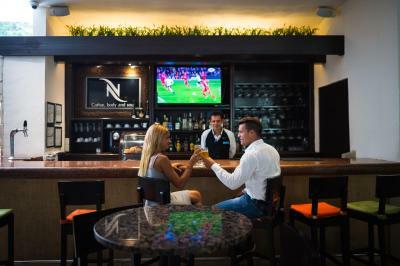 Guests can enjoy a variety of dishes and international cuisine in one of the 4 specialty restaurants available on-site. There is also an Ice Cream Parlor and a Bakery serving fine pastries, tea and coffee. 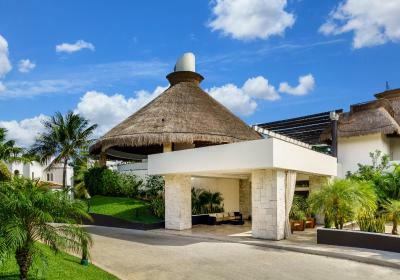 뀐 Located in the top-rated area in Playa del Carmen, this property has an excellent location score of 8.9! 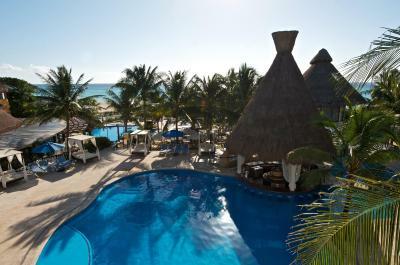 When would you like to stay at The Reef Playacar - All Inclusive? Overlooking the gardens, this air-conditioned room offers a private balcony or terrace, a TV, a mini-fridge and a telephone. The bathroom includes a hairdryer and ironing facilities are also provided. A safe is available to rent. 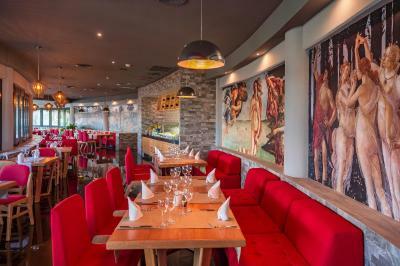 The standard all-inclusive package consists of buffet meals, snacks, domestic alcohol and soft drinks and à la carte dinner option in the Botticelli Italian restaurant. Activities for children and adults, including aerobics, gym access, cycling and nightly entertainment are provided, and non-motorized watersports such as sailing, kayaking, snorkeling and scuba diving are also included. This air-conditioned premium room offers a private balcony or terrace, a TV, a telephone and a safe. There is a coffee maker and a free mini-bar stocked with beer and soft drinks. 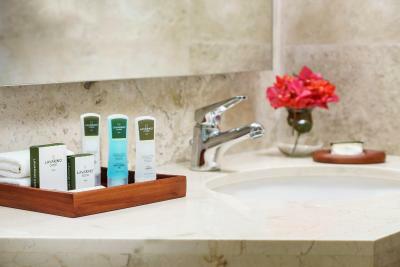 The bathroom includes a hairdryer, bathrobe and free toiletries, and ironing facilities are also provided. 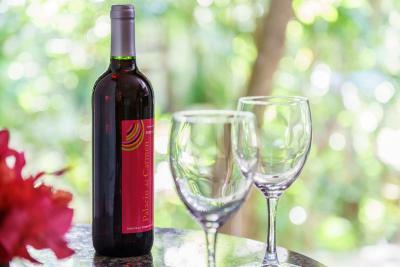 A bottle of wine is provided on arrival. Free WiFi is offered only in this category. The premium all-inclusive package consists of buffet meals, snacks, international alcohol and soft drinks, access to the beach lounge bar and a choice of 2 à la carte restaurants. Activities for children and adults, including aerobics, gym access, cycling and nightly entertainment are provided, and non-motorized watersports such as sailing, kayaking, snorkeling and scuba diving are also included. There is a 25% discount for any spa service in the Reef Spa. 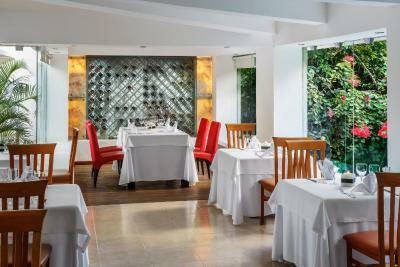 This package also includes one dinner per guest in the Japanese restaurant located at The Reef Cocobeach. 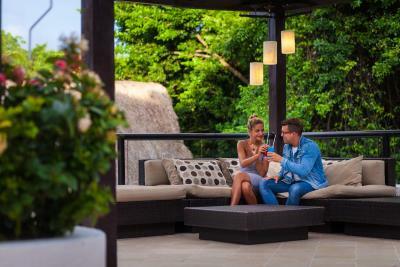 Guests can enjoy a day at The Reef Cocobeach including the All Inclusive service. This double room features a balcony, tile/marble floor and cable TV. This air-conditioned room offers a private balcony or terrace, a TV, a mini-fridge and a telephone. The bathroom includes a hairdryer and ironing facilities are also provided. A safe is available to rent. 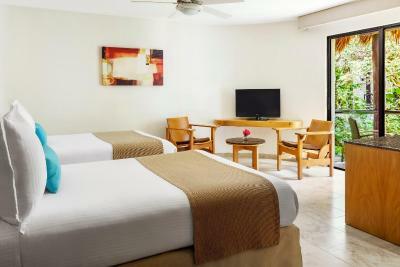 This air-conditioned premium room offers a private balcony or terrace, a TV, a telephone and a safe. There is a coffee maker and a free mini-bar stocked with beer and soft drinks. 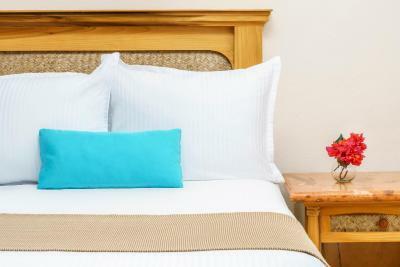 The bathroom includes a hairdryer, bathrobe and free toiletries, and ironing facilities are also provided. A bottle of wine is provided on arrival. Free WiFi is offered only in this category. 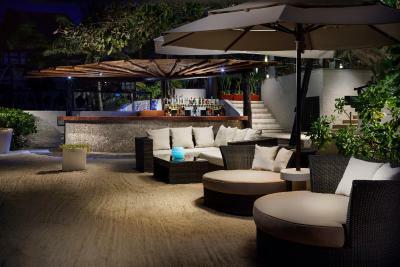 The premium all-inclusive package consists of buffet meals, snacks, international alcohol and soft drinks, access to the beach lounge bar and a choice of 2 à la carte restaurants. 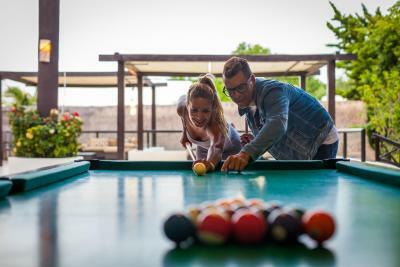 Activities for children and adults, including aerobics, gym access, cycling and nightly entertainment are provided, and non-motorized watersports such as sailing, kayaking, snorkeling and scuba diving are also included. There is a 25% discount for any spa service in the Reef Spa. 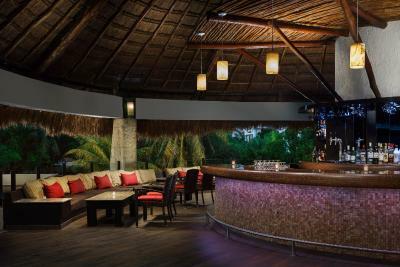 This package also includes one dinner per guest in the Japanese restaurant located at The Reef Cocobeach. 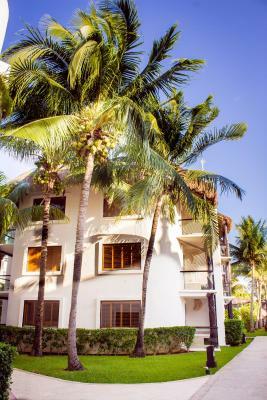 Guests can enjoy a day at The Reef Cocobeach including the All Inclusive service. Nestled in the heart of the Riviera Maya on Mexico’s sun-splashed Caribbean coastline, The Reef Playacar Resort & Spa takes a page from the playbook of the ancient Mayan Gods. Magically blending the quiet seclusion of a tropical rainforest with the white-hot beauty of one of the world’s most spectacular beaches, this all-inclusive oceanfront resort captivates fun-loving families while simultaneously catering to couples who seek solitude. 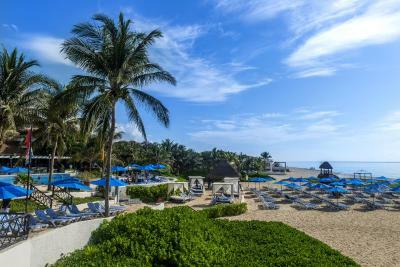 House Rules The Reef Playacar - All Inclusive takes special requests – add in the next step! One child under 12 years is charged USD 93 per night when using existing beds. The Reef Playacar - All Inclusive accepts these cards and reserves the right to temporarily hold an amount prior to arrival. Please note that the charge for the extra person depends on the season and should be paid upon check in. Gardens are beautiful . Rooms spacious , super clean and very relaxing. T V has enough channels in English to have a fair choice. Stay clear of cocktails and drink wine, beer or. things like gin and tonic then the drinks are fine. Wide choice of food on offer. The food was perfectly fine for me. Fresh sea food to grill, salads, meat etc. Service very friendly but can be rather hit and miss! I didn’t love the food. Just ok compared to other all-inclusives. I found something to eat at each meal but it wasn’t my favorite. We ended up ordering pizza one night and eating at Cirque du Soleil another. One of the few disappointments is that for the buffet, I often had to wait for a table when they were many available. I was looked at by the staff, but not acknowledged to receive a table. (Maybe they're not used to solo travelers?) This happened at the buffet more than once and a the Terraza Grill once. It was hit or miss. The food was great though. I think the buffet staff was largely young and inexperienced. Most of them are young adults. Wifi is not free. You've got to upgrade to get wifi. My TV didn't work, but I didn't need it. The days were full. Something I don't understand is how bad the mixed drinks are (premium or not). There's no juice nor fruit in the cocktails. It's all mixed with sugar water (literally sugar, water, color). So even if you put branded liquor in it (which they have plenty) the end result is terrible. There are no juices nor sodas at the bar either (even if you wanted to pay for it). If you don't want alcohol, you can get water. We ended up mixing liquor with the canned sodas from the room fridge and bought juice at a oxxo. I think it's easy to improve this for future guests. the location was great right on the beach and walking distance to town, nice meals and drinks, accommodating staff, activities available, pleasant rooms. The food was terribile, the beach dirty, no hot water to shower. Airco not working, WIFI not included and when bought very weak signal. The garden and the service. There were no wi-fi in the rooms. The reseptionist told us for wi-fi you must to pay extra 7 USD/day. It was very strange for 4-stars hotel. We have refused to pay extra cost for a internet and we bought SIM card from a local mobile operator with internet acccess (20 days ) for 7 USD. The chambermaids were very noisy during their work. Two days we had only one towel in the bathroom for two people. We asked the staff for more towels, they explained that there are no clean towels at the moment. There is no safe in the room. 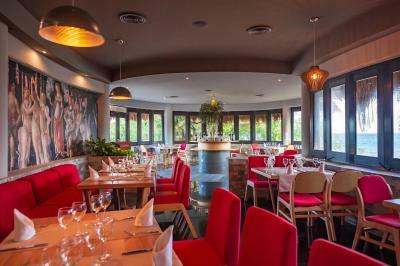 Perfect location, amazing garden, nice beach, good food and service in the main restaurant. Weird rules about receiving friends. You have to pay $53. Basically you can’t so you’ve to talk to them in the lobby. The food was not so good, but I was expecting it. No free WiFi, 15 USD for one day! The service people were very nice and helpful. The variety of food and drinks was very good. The hawking of time shares when we arrived, the food was not good besides the formal restaurants. We upgraded our package but we were not greeted with bathrobes and wine as included. Bed was hard as a rock. Also it was very difficult to find a beach chair with an umbrella, if you don’t have one prepare to burn! I thought upgrading would add that, guess not. The hotel is in a nice location, very near to the Fifth Avenue (walking 15 minutes, by taxi 5 minutes and 120 pesos). Hotel garden has a cool jungle like design, pools and beach was also nice. Room was spacious and had nice furniture in it. SPA is small, but the Mayan massage was great and we liked the staff-very friendly and helpful.